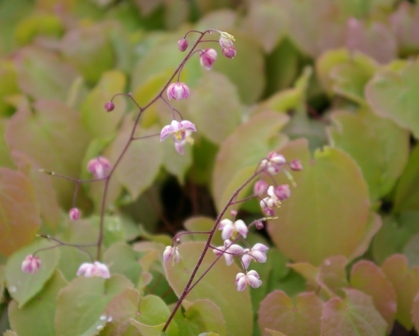 Joy Creek Photo Archive (c) all rights reserved Epimedium pubigerum is a clumping, evergreen groundcover with bronzed young foliage. Tiny white flowers with a faint hint of pink. Spring. 18 in. x 18 in. One of the most choice plants for dry shade once established.